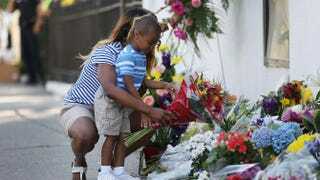 Tamara Holmes and her son Trenton Holmes lay flowers in front of Emanuel African Methodist Episcopal Church in Charleston, S.C., after a mass shooting at the church that killed nine people June 18, 2015. When the murderer who embodied evil visited his bloodthirst on the good people gathered at Emanuel AME, a 5-year-old girl saved herself by lying motionless on the floor, pretending to be dead so that she could live. In the familiarity of a church where she’d been blanketed in love, she witnessed the ferociousness of hate, all of her senses overwhelmed with fear as a terrorist methodically assassinated the congregants around her like flesh targets. That’s a trauma too big to understand unless you’ve actually lived a similar one. I hate that it’s a child, a baby girl, trying to make sense of it, because she won’t be able to. There’s no making sense of it at all, for anyone. We pray for the restoration of this little girl’s spirit, God. We reject the possibility of her becoming a martyr to the savagery that would execute an 87-year-old woman and attempt to snuff a 5-year-old child. Don’t allow her life to be all about this. She is extraordinary because she is still here, and we call forth the greatness that you’ve placed in her—that you’ve intrinsically placed in all little black girls—to navigate her into holistic health, from her mind to her emotions to her psyche to her body to her soul. Refresh her innocence and replenish everything that has been lost in the experience of witnessing evil’s handiwork in action. The rush to forgiveness has done black folks few earthly favors. Give her the space to process through her emotions fully without premature expectations and the pressure to be sanctimonious. Instead, call her to be real. When her anger wells up, give her voice to express that. When she’s experiencing fear and anxiety, give her a productive outlet to vent those emotions, then replace them with peaceful inner calm. When she’s feeling guilty about surviving or leaned on to be anything other than what she is, reassure her that all of her feelings are valid and worthy. Show yourself to her, God. In the times when she questions where you are, be a brilliant guiding star. Be a comfort. Be a friend. Be a coach. Be a counselor. Be a parent. Be a cheerleader. Be what she needs you to be in the moments when she needs you the most and the times she calls on you the least. When she’s at her most fragile, protect her from memories and flashbacks that would set her off course from what you have for her. Remind her of her unique kind of amazing on days when she’s not feeling or seeing it. Give her a life of laughter and joy, of authenticity and pride in herself, her faith and a community that remains indestructible, in spite of the racism, in spite of the hatred, in spite of the calculated attacks and institutionalized assaults against us. We declare that nothing from this trauma will hold her back. Cover her completely in an armor of divine favor and open doors of opportunity for her academically, personally and, as she reaches young adulthood, professionally. Build her up to be intelligent and wise, resilient and compassionate. Make her a world traveler and, most important, a world changer. Place in her life a village of relatives and therapists and educators and mentors who possess the specific kind of support that she needs at the specific point in time that she needs it so that she will always have for her benefit the resources to become the person you have designed her to be, the young woman we need her to be. Heal her, Lord. Not so that her life can be a wow-factor testimony—we have plenty of those already, and she needs to be able to choose when and how she wants to share this part of her story. When she’s ready, help her to tell it in a way that empowers her and reminds her how precious her life is so that she will live it big, powerful, unapologetic. While we debate the social politics of gun control and systemic racism and unethical ancillaries, while we mourn the many losses we accumulate because America really is not the land of the free or the home of the brave—not on the eve of its own patriotic holiday or any other time—while we honor the lives of the nine brothers and sisters who were killed because they extended a welcome to a sinister stranger in your house, we thank you for this girl’s life. We thank you for giving her the restraint and obedience to play dead in the midst of chaos. Continue to keep her safe and protected, but never limited and guarded, and show out in her and through her, bigger than we can imagine.